LINCOLNSHIRE FBU has been campaigning recently against proposed cuts in local services. They have taken to the streets to protest at the way the cuts are being brought in through the back door following alleged consultation, writes Marc Glasscoe. STRIKE ACTION by PCS members in the Department for Work and Pensions (DWP) has brought management to the negotiating table and forced them to make an offer to settle the dispute, writes Jane Aitchison, PCS DWP president, personal capacity. TOMMY SHERIDAN has won his libel action against the News of the World (NoW) and Rupert Murdoch's media empire. It is a victory not only for Tommy Sheridan, but for socialists and the left internationally over one of the most most reactionary, anti-working class news organisations in the world, writes Sinead Daley, SSP executive member and CWI. ISR takes to the streets! Reports from swansea, Bristol, Huddersfield and Leeds. 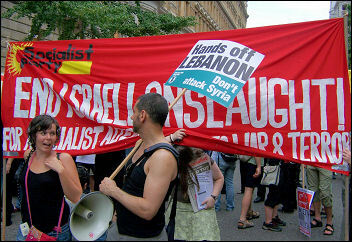 Swansea ISR members held a protest on 22 July against the brutal Israeli bombardment of Lebanon. In just over an hour we managed to speak to over 50 young people by going round where they hang out with the petition and leaflets. THE RECENT horrors in Lebanon and the ongoing quagmire for the occupying forces in Iraq have pushed the war in Afghanistan out of the main news headlines, writes Steve Score. Israel out of Lebanon now! 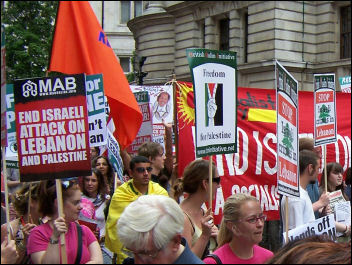 AS ISRAELI missiles continued to bombard Lebanon, an immediate ceasefire was demanded by an emergency demonstration of 100,000 people in London on 5 August, writes Jenny Brooks. WORKERS IN Ford's parts business Visteon are facing rumours that the company is looking to sell. Union representatives met the European management in Germany last week to get an update on the sale of the chassis division, writes a Visteon worker. Cream for fat cats - debts for us! "YOU CAN'T trust the Liberals", an angry council tenant said on leaving the 26 July meeting of Lewisham council. Socialist Party councillors Ian Page and Chris Flood had moved a resolution calling for tenants to be balloted, writes Clive Heemskerk. Lincoln Socialist Party held a public meeting on 16 August to build a coalition against the rise of the BNP and far right in our area. Over 30 people, including trade unionists, campaign organisations and local activists supported the initiative to launch Lincoln against Racism and Fascism. SOCIALIST STUDENTS is planning its campaigning activity in colleges and universities across the country for the next term, writes Matt Dobson Socialist Students national co-ordinator. ...so let's give him one at schools and colleges around the country! *No to NHS job losses, cuts and closures. THE NHS in Sheffield faces huge cost-cutting measures. Over £100 million has already been announced in cuts over the next three years. About 10% of this is based at the Sheffield Children's NHS trust, writes Jon Smith GMB branch secretary, Sheffield Children's hospital. PONTEFRACT'S 70-strong "Keep Our NHS Public" meeting unanimously supported the proposal to set up a broad-based campaign to defend local health services and fight NHS privatisation, writes Mick Griffiths Wakefield and Pontefract hospitals UNISON branch secretary (personal capacity). 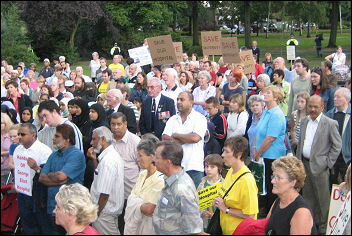 OVER 300 people demonstrated against proposed hospital cuts in Nuneaton on 17 August. The Acute Services Review wants to transfer some emergency care along with children's and maternity services from Nuneaton to the new PFI hospital in Coventry. ON 21 August, UNISON issued ballot papers to over 750 members across the five NHS Logistics (NHSL) depots at Alfreton, Bury St Edmunds, Maidstone, Normanton and Runcorn. The ballot will close on 11 September, writes Brian Loader, NHSL National Staff Side Secretary, personal capacity. "We won't be treated like dirt"
LOW-PAID ancillary workers were on the picket line outside Whipps Cross hospital in east London on 14 and 15 August. 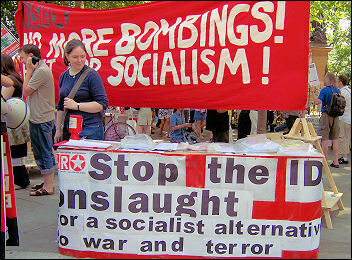 "We are determined to get a just settlement of our claim", joint UNISON branch secretary Len Hockey told the socialist. THE LATEST alleged terror plot in the UK has brought memories of 7/7 flooding back, when more than fifty people were killed while travelling to work in London, writes Hannah Sell, Socialist Party deputy general secretary. THE ISRAELI ceasefire was met with great relief in Lebanon. During 34 days of intensive shelling, over 9,500 Lebanese 'targets' had been hit by the Israeli army and navy, writes Jenny Brooks.